The Career Achievement Award recognizes seminal work in medical decision making. The SMDM Award for Distinguished Service recognizes exceptional efforts in support of the Society. 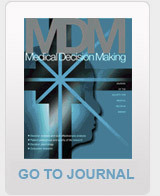 The John M. Eisenberg Award for Practical Application of Medical Decision Making Research is given in recognition of exemplary leadership in the practical application of medical decision making research. The Career Achievement Award recognizes distinguished senior investigators who have made significant contributions to the field of medical decision making. The SMDM Award for Distinguished Service recognizes service to SMDM in terms of leadership, role in the operations of the Society, and contributions to the scientific and educational activities of the Society.